Everard Meade is Professor of Practice and Faculty Director of the Trans-Border Institute at the Kroc School. His research explores the relationships between violence, memory, and the law, and how to apply them in practical peacebuilding. He has written a sweeping history of the death penalty in Mexico (Forthcoming from Stanford University Press), co-edited a book on the lessons and legacies of the War on Terror (Routledge, 2012), and translated a collection of first-hand accounts of the drug war in Sinaloa, by local journalist Javier Valdez Cárdenas (University of Oklahoma Press, 2017). He is currently documenting the substantive practices that define impunity in contemporary Mexico, through dozens of long-form interviews. Dr. Meade directs peacebuilding programs in Mexico that have trained hundreds of activists, entrepreneurs, academics, and public servants in Culiacán, Sinaloa and Tijuana, Baja California. 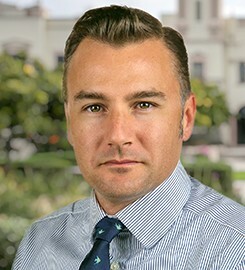 He also directs the Trans-Border Opportunities Certificate Program, an introduction to the politics, places, people, and products that define the U.S.-Mexico border. Dr. Meade serves as an expert witness in immigration courts across the country, and on the advisory board of the American Bar Association’s Immigrant Justice Project. He is a frequent commentator in the national media. Submit changes to Everard Meade's profile.